My earliest memory of baking is making bread with my Mom. Typically on Saturday mornings, while I would be busy with the classic 80’s cartoons, the house would fill with fresh-baked pungency as my Mom would make not one, but sometimes as many as 8 or 10 loaves of Italian bread. 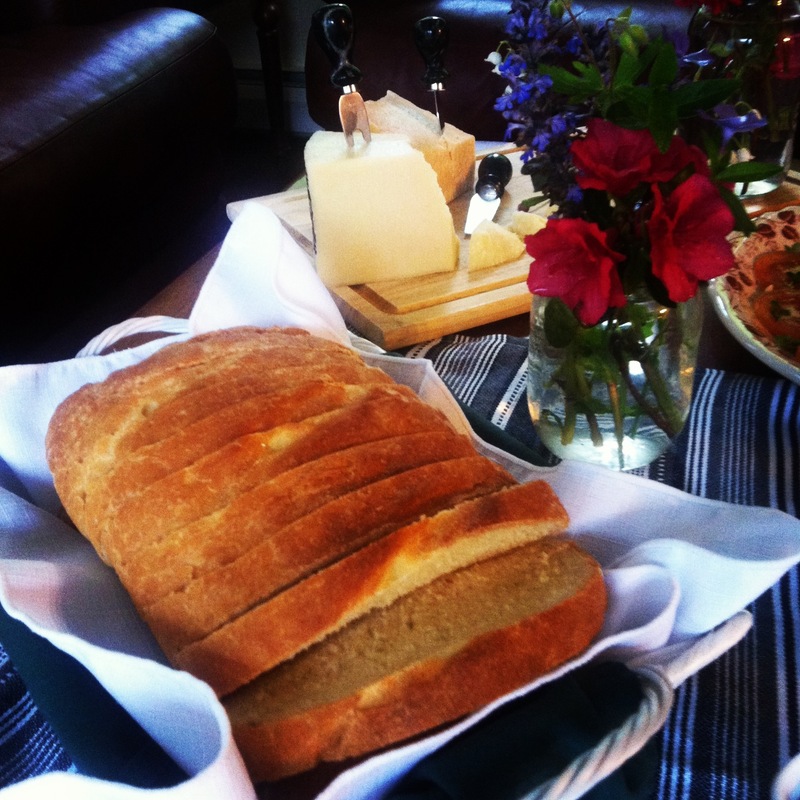 After so much resistance, and of course during commercials, I would venture downstairs to our ‘2nd’ kitchen (standard in Italian households), and my Mom would make me a plate of several slices of warm bread, drenched in butter. If it was a chilly day, I’d steal one of the blankets covering the rising dough and head back to my cartoons. In a large bowl, add flour and salt. Whisk to evenly disperse the salt into the flour. In a small bowl, add the yeast to 1 cup warm water. Mix to dissolve and add sugar. 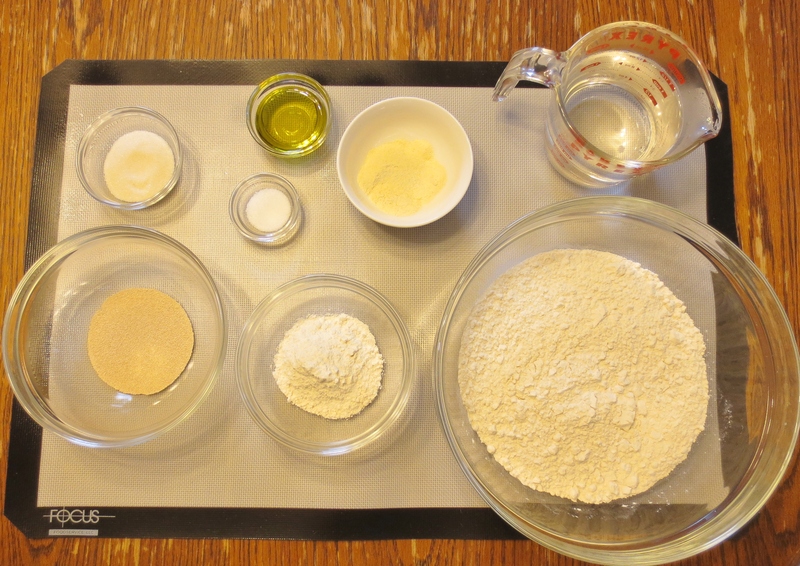 Allow to sit for about 15-20 minutes until ‘foamy.’ Add to the flour mixture with the olive oil. Mix gently with your hands in a circular motion, fingers spread wide (I don’t really knead this particular bread – I like it fluffy and airy and find this method works). Add the remaining water, and mix gently until a sticky dough forms. 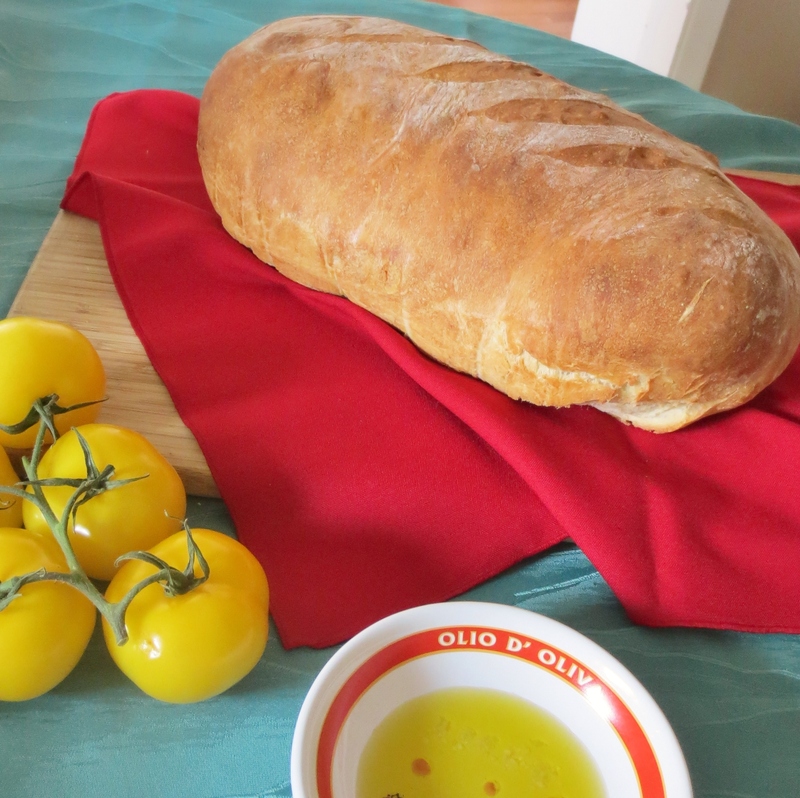 Coat a large bowl with olive oil, and drop the dough into the bowl. Cover the bowl tightly with plastic wrap. Put a few kitchen towels, a couple of blankets, whatever you have to keep the bowl warm (this is called, “proofing,” allowing the dough to rise and let the yeast work its magic). Allow to ‘proof’ for about 1 hour. Preheat the oven to 415 F. Sprinkle the dough with some of the handful of flour and around the sides (this helps you handle it because don’t forget, it’s a bit sticky!). Do not ‘deflate’ the dough. Sprinkle a large baking sheet (about 13″ x 18″) with the cornmeal. Plop (yes, you heard me, PLOP) the dough into the center of the pan on top of the cornmeal and form a loaf with your hands. Pat the top of the dough with a very light sprinkle of flour, being careful not to deflate the dough! (it bears repeating) Using a large, sharp knife, cut slices over the top of the loaf. Cover with a clean kitchen towel and allow to sit 15 minutes. Remove the towel and bake at 415 F for about 30 to 40 minutes (depending on your oven). – Make a savory dry spice combination and sprinkle on top for a twist – I like to use a combo of rosemary, sea salt, and black pepper. You could also do parsley and hot pepper flakes! – Use this same dough recipe to make individual rolls/buns or a pizza! For the pizza, spread onto an olive oil greased baking sheet and bake about 8 minutes. Remove, add your sauce, choice of toppings, and cheese and continue baking an additional 10-15 minutes. – You can double or even triple the recipe (but you’ll need much larger bowls) or just repeat the recipe several times since you’re already making bread. It’s a great weekend project – and the loaves freeze beautifully for about a month (if they last that long). Once cooled, you can slice the loaves before placing in freezer bags, and when you want a slice or a loaf, toast lightly.